In the weekend there was a protest festival in the North West neighborhood of Copenhagen called ’BygForFremtiden [BuildForTheFuture]’. I was asked to make a talk at the festival because arki_lab currently work with age-integration in the city, as part of our intergenerational research project funded by the Ministry of City and Housing. I had the pleasure to do discuss the problem with a group of engaged participants. 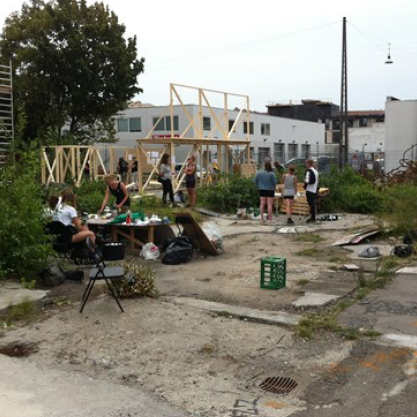 The festival was trying to bring attention to the severe lack of student housing in Copenhagen, by taking over an abandoned building plot and build an actual house on it. The lack of student housing is a result of several tendencies and the complex nature of the housing and construction marked, which makes it an interesting question of inquiry. In recent years two main trends have brought pressure on the housing market in Copenhagen. First and foremost the requirement for young people to get an education all of which are centered in the major cities. Beside that we have seen a change in the behavior of modern families. Before a family would move to the suburbs to get space and meet the needs of the children. Nowadays an increasing group of families choose to stay in the city and transform the city according to the same needs for example by building gardens all over the city. This new citizen group is catered for in newbuild areas such as ‘Sluseholmen’, with large expensive apartments in family friendly neighborhood. This creates tension as gentrification processes slowly increase the quality of for example the old bridge neighborhoods and thereby also the rent. This makes life harder for the socially excluded and people with less money on the bank account – like students. But why not just build 1000 student apartments of containers, which could be made in less than half a year, according to Mette Annelie Rasmussen from the Danish Social Liberal Party? One of the reasons, I argued, are the importance of balancing demographics. This means that a huge surge of young people into a neighborhood might challenge the existing culture and make another kind of gentrification. In our work in Albertslund, we can clearly see on our age-mapping on the area where the International Dormitory of Denmark is placed – it tips the age average of the whole center of Albertslund drastically. This is combined with student dormitories being the most extreme examples of an age-ghetto we know and they often closes around themselves without giving much back to the neighborhood. Therefore the location of student housing needs to be carefully considered. Another reason is the young age-groups lack of resources. Both on an economical level where they are not an attractive investment for developers as target group and on a political level where they are not well represented or integrated in the political system and thereby don’t have the necessary force to push the political agenda. This underlines the importance of activism such as BygForFremtiden that frames the societal problem of lack of housing. There is an important distinction between the personal need for a place to live and the structural need for more housing. The blame is not to be placed on the individual but on the collective society. I focused on giving examples on different approaches to living arrangements, which might start in the personal sphere, but had the potential to grow towards societal levels. Can we start a trend to live outside the city and commute? What do you need to bring with you out of the city? Your friends? Can we start a movement for people to rent out spare rooms in huge apartments and villas? Can we organize us differently so that spare rooms at care centers or other institutions can be uses by students in return of small services? These are possibilities that start with people being first movers and creating waves that ripple through society and thereby affect the structural problem. But these are small initiatives that run parallel to the main tough bureaucratic fight with the complex system of housing development. The simply gesture of actually constructing a building on an empty lot during a weekend is a testimony to the complex web of invisible string covering and binding the city. Both keeping it in place and constraining it’s ability to evolve. Sometimes the walls of regulations, legislation, neighborhood plans, contractors, investors, landowners and local politics are more real and firm, than the actual people in the area building a wall of bricks. This must give pause for thought. My main point towards the people at the talk was the question of how we can circumvent all these restrictions so we can start that important process of building something, literally from the ground – the kind of creative user-involving processes that are our goal at arki_lab, which end in an integrated living building born of the neighborhood and the needs of its inhabitants.